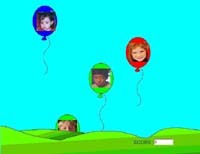 I developed the Balloons Task as part of my M.A. thesis in Psychology, completed under the direction of Professor Avi Sadeh. The aims of the study were: (a) to develop a new instrument for the developmental assessment of executive functioning (EF), which will be both engaging and challenging for a wide age range, enable repeated assessment, include neutral and social information, and enable adjustable difficulty level. (b) to provide new data on EF development as it relates to age, gender and reported behavior problems. The concept executive functioning (EF) refers to goal-directed, self-regulated behavior that requires complex behavioral-organization. Deficiencies in EF have been associated with prefrontal cortices (PFC) dysfunction and extensive research has focused on measuring EF in abnormal populations that suffer from developmental psychopathologies such as attention deficit hyperactivity disorder (ADHD). In addition, neuropsychological studies have illustrated developmental changes on EF tests across childhood. Many tasks have been considered as relevant to EF, however, most of the tasks have been developed for adults and their applicability for a wide age range including young children is limited. Rosenberg-Kima, R. B., & Sadeh, A. (2010). Attention, response inhibition, and face information processing in Children: the role of task characteristics, age, and gender. Child Neuropsychology, 16(4), 388-404. These models were created at the Center for Research and Innovative Technologies for Learning (RITL) group directed by Dr. Amy L. Baylor. My role was the leader of the development team. In a line of studies we examined the prospect of changing middle-school and undergraduates students' attitudes towards careers in engineering using computer-based social models (3-D interface agents). In particular, we examined the influence of the agent characteristics (e.g., gender, race, age, cool or not), its presence (e.g., agent vs. voice only), and its message. Click on the picture to get a full list of studies with links to the agents models. Rosenberg-Kima, R. B., Plant, E. A., Doerr, C. E., & Baylor, A. L. (2010). The influence of computer-based model's race and gender on female students’ attitudes and beliefs towards engineering. Journal of Engineering Education, 99(1), 35-44. Plant, E. A., Baylor, A. L., Doerr, C. E., & Rosenberg-Kima, R. B.(2009). Changing middle-school students' attitudes and performance regarding engineering with computer-based social models. Computers and Education, 53(2), 209-215. Rosenberg-Kima, R. B., Baylor, A. L., Plant, E. A., & Doerr, C. E. (2008). Interface agents as social models for female students: The effects of agent visual presence and appearance on female students' attitudes and beliefs. Computers in Human Behavior, 24(6), 2741-2756. The Colors of the Rainbow website was created at the Center for Educational Technology (CET). My role was the programmer. It includes explanatory text as well as mini labs that were designed to provide the learners opportunities to examine the nature of color. This website is in Hebrew, nevertheless, you can use Google toolbar to translate it to English (not a perfect translation, but might be better than trying to read it in Hebrew...). The site is a collaboration between the Center for Science Education and Technology at Tel-Aviv University, headed by Dr. Rafi Nachmias, Science and Technology project middle school, headed by Dr. Ruth Strohl-Novick and Dr. Liat Ben-David and the Department of Information Technology headed by Ms. Ofra Razel - the Center for Educational Technology. The Transportation website was created at the Center for Educational Technology (CET). My role was the programmer. Similar to the colors website, it includes explanatory text and "mini labs". This website is in Hebrew, nevertheless, you can use Google toolbar to translate it to English (not a perfect translation, but might be better than trying to read it in Hebrew...). 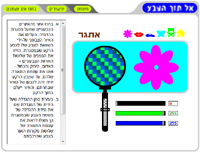 The site is a collaboration between the Center for Science Education and Technology at Tel-Aviv University, headed by Dr. Rafi Nachmias , Science and Technology project middle school at Tel-Aviv University, headed by Dr. Ruth Strohl-Novick and Information Technology Division headed by Mrs. Ofra Razel Exchange - the Center for Educational Technology. The Geometry Buds software (available only on CD format) was created at the Center for Educational Technology (CET). My roles were the leading programmer as well as content design and characterization. In this software, the children (ages 6-9) engage in active schema construction of geometry concepts. For example, in the sticks stand (see left picture below), the child uses the sticks drawers to select the right sticks and then uses them to build the shape that appears on the left. In the Balloons room (see middle picture below), the child needs to build the shape that appears on the basket with the shapes that appear on the balloon (like Tangram). In the dark rooms (see right picture below), the child needs to select the shape that is "hiding" behind the doors. 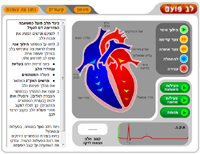 The Be Healthy website was developed in collaboration with the Ministry of Health Israel by EagleShade. My role was the programmer. 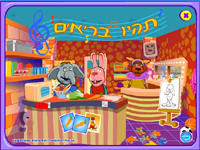 The purpose of this site is to educate children to good health habits through games. When entering the main room you can see for example a puzzle on the floor, a car that leads to road safety game, memory game, and so on. All of these game incorporate educational messages. In my dissertation, completed with the guidance of Dr. David Merrill, Dr. Amy Baylor, and Dr. Tristan Johnson, I presented a theoretical model that explores the reciprocal interaction between motivational and cognitive considerations in the process of complex learning. In particular, I used this model to explain the rational behind the task-centered instructional strategy, which is a form of explicit instruction yet in the context of authentic, real-world problems or tasks. See also full paper. In the task-centered condition, the learners were first presented with three tasks with increasing levels of difficulty. Each of the three steps (tasks) included all the elements of the whole-task, thus, in step one, for example, the learners learned the basics of timeline, texts, and buttons. In the topic-centered condition, on the other hand, no tasks were presented to the learners up front. Instead, objectives were presented to the learners at the beginning of each topic section (timeline, dynamic texts, and buttons). Thus, in the topic-centered condition, each of the three steps (topics) referred to only one of the topics, for example, in step one, the learners learned only about timeline effects. It is important to note that while the order and the context of the instruction were different, the content (e.g., how to create a button) was identical for both conditions. 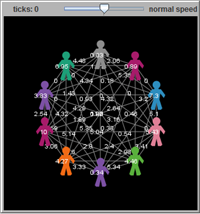 I developed this simulation with NetLogo to simulate team-based learning. The project was led by Dr. Tristan Johnson at the Learning Systems Institutes. Agent Based Modeling (ABM) is a simulation modeling technique that uses a collection of autonomous decision-making entities called agents to model a system (Bonabeau, 2002). This computational method enables a researcher to create, analyze, and experiment with models composed of agents that interact within an environment (Gilbert, 2008). According to Bonabeau (2002) the benefits of ABM over other modeling techniques are: (a) ABM captures emergent phenomena (i.e., phenomena that results from the interactions of individual entities); (b) ABM provides a natural description of a system (e.g., modeling a traffic jam); and (c) ABM is flexible (e.g., it is easy to add more agents, change rules and behaviors, and so on.). Unlike traditional scientific approaches which are inductive in nature (i.e., discover patterns in empirical data), in ABM a set of rules is defined and the emergent phenomena is captures from the bottom up when the simulation is run (Axelrod, 1997; Bonabeau, 2002). ABM has been applied to various domains including consumer behavior, flow management, and distributed computing (e.g., Bonabeau, 2002; Gimblett, 2002; Jonassen & Jager, 1999).